This is an N Scale Town and Factory Building Set from Woodland Scenics. It includes 13 DPM Building Kits for Scenic Ridge or any N Scale Layout. It's recommended for ages 10 to adult. A collection of 13 individual architecturally-detailed N scale building kits. The kit includes more than 70 detailed accessories and 60 Dry Transfer Decals. Though created to complement Scenic Ridge Layout Kit, these buildings will create an authentic city environment on any layout. Retail $169.99 SAVE 25% ! Over 70 cast detailed accessories. Over 60 colorful dry transfer decals. Custom door and window canopies. Instructions and suggested street plan. 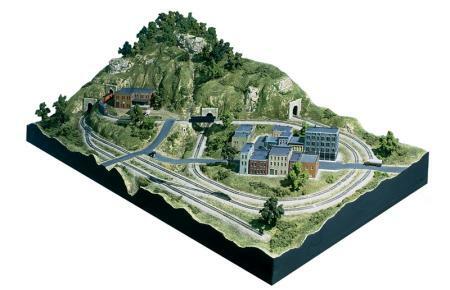 Detailed buildings may be placed as seen on the Scenic Ridge Layout, or arranged to make a town of modeler's own design. Each building includes its own set of instructions. One 6" wire for sidewalk canopy. One full color poster sheet. The Town & Factory building kit consists of an assortment of former-DPM building kits, as well as dry transfer decals and white metal cast detail parts. The kit quality is excellent, as you&apos;d expect from Woodland Scenics/DPM, and the white metal castings are surprisingly clean and detailed. This set is fantastic value for money, and offers a significant cost savings over buying the individual kits. I would recommend this set, even if you don&apos;t need all the buildings - they&apos;re excellent kitbashing fodder! "A very good deal but it has its problems"
This kit contains 13 buildings with white metal accessories including street lamps, billboards, propane tanks, roof vents, etc. Woodland Scenics&apos; Town & Factory was specifically designed for their Scenic Ridge layout. I have found that this kit is the least expensive way to build the edge of town on any layout; however, there are some problems. The kits are basically 4 walls and a roof which you must cut. Any detail you might want must be brought out with your own painting skills. 4 of the 12 kits I built had back walls wider than the front and had to be trimmed to make the buildings square. Cook&apos;s Drugs had a wider front than back but could be fixed. I have uploaded pictures of these structures on my layout and I think they look very good--but I am an accomplished modeler. Additionally, the footprints listed on Woodland Scenics web site and on the individual kits are incorrect. When laying out your city blocks, you must measure the pieces in the kit to get the correct footprint. If you have more time than money, this is the kit for you. "13 buildings and detail parts"
13 buildings from woodland scenics n scale every thing you need in one kit. Its hard to beat. Hobby Linc the only place to shop on line. Keep kit and small parts away from young children. NOTE: Scenic Ridge Layout or any N Scale Layout is NOT included with this town and factory building set.